We're the first generation of parents having to deal with this online world and the dangers are not obvious. 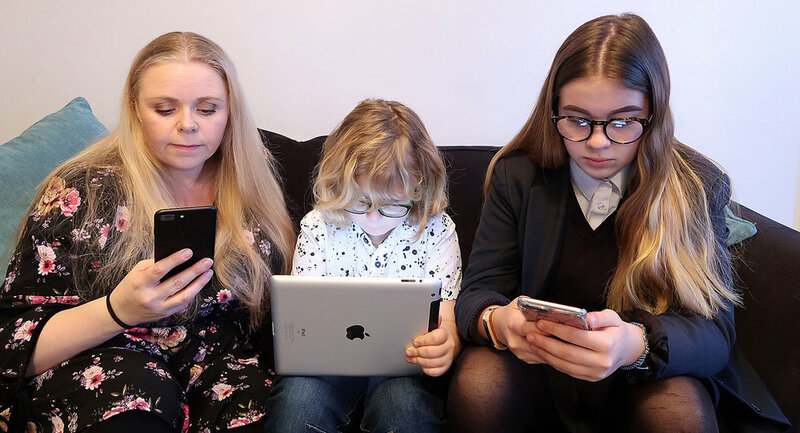 As a mum to a 15-year-old daughter and an 8-year-old son, I’m trying to understand this online, app-based, smartphone, tablet watching, virtual, 24/7, social world we are living in now. I love that my children have access to information and education in the online space, but as a parent, the fear is very real of the horrors that they can access lurking under the surface only a few clicks away. If I cross the road, my instinct is to hold my child’s hand, if we go anywhere in the car, I make sure they are wearing their seat belts. I can see these dangers, but can’t see the dangers online. Reading the tragic story of Molly Russell who took her own life after looking at self-harm pictures on Instagram is utterly heartbreaking and my heart goes out to her parents and family. Listening to Molly’s dad Ian, talk about what happened is devastating. Around 200 British schoolchildren take their own lives each year. We can’t say all these are down to social media, but it’s no surprise to me that the waiting times for the NHS's Child and Adolescent Mental Health Services CAMHS are so long and services in school are at full capacity. My husband Mark and I, are terrified at the things our teenager can potentially see and access online. My head is spinning as a parent so imagine how children and teenagers feel thinking they have to have a certain online presence and the pressures that go along with that. The online pressures children face in many areas of their life is clearly affecting their mental health. We are the first generation of parents to try and understand this online world and the new way of life. I think it’s the biggest gap there has ever been between us and our kids. We don’t have previous generations offering us parenting advice because it has never been like this before. I loved playing games on my ZX Spectrum in the ’80s, on games like Chucky Egg and Manic Miner, but we are a world away from that now. The little smartphone they hold in their hands can cause so much joy and also so much pain. The way of life for teenagers now is very much a social one, but not in the way you or I would relate to. Their social world is online and all about the followers and likes. Those little thumbs tapping away on their phone in a world where parents don't see most of it. The tech giants, big social media and technology industry experts need to do more to protect our children, take more responsibility, and allow them to have a good online experience. They are not doing enough. But as a parent, I know that I have to learn more about it myself. I like to think I am quite tech-savvy, I have a website, a YouTube channel, social media accounts, I am on my phone quite a lot. I go to YouTube for tutorials on things I want to learn, I will post a picture on Instagram when we have had a nice day out, keep in touch with family and friends on Facebook, but I use all these in a different way to my daughter. She uses Instagram as a group messaging service, with Snapchat being the main way she communicates with friends, but Facebook is seen as a parents place to be social. I have worked with Internet Matters to record videos for parents on how to set parental controls while trying to learn more so I can help protect my own children. I met Prince William at the launch of the Stop, Speak, Support campaign to tackle cyberbullying. This is a huge issue in so many lives. I know I need to use my phone less and set an example to my children. Keeping up to date with the latest apps and online crazes is so difficult. As I sit here and look around my living room I see my eight-year-old son Jacob laughing out loud watching a YouTube video on his iPad. My daughter is in her bedroom on her Xbox. She is talking to her friends on Xbox Live and playing games with them. My husband is in the kitchen preparing dinner while listening to music and also looking at tweets on Twitter. I am looking at Facebook on my phone and watching TV. My children don’t watch TV very much anymore. It’s Netflix for Amber and YouTube for Jacob. After homework has been done, this is a typical evening in our house. Honestly, I don’t fully know what my children are getting up to while they’re online. I can only hope that by me talking to them about the dangers that it will help them have a good experience. Amber is a big gamer, unlike many of her female friends, she loves gaming. She enjoys playing on her Xbox and chats with her friends through Xbox Live (an online gaming subscription service) while playing games with people around the world. As with many children, she got caught up in the Fortnite craze, which has now gone out of favour with her and her friends. We once had an incident when Amber was 12 years old. My husband walked into her bedroom and heard a grown man’s voice talking to her in the headset she was wearing. A friend in Germany that sounded like a grown man talking to our 12-year-old girl. Terrifying! This shocked both myself and Mark, and we didn’t realise that Xbox Live gives you access to people all over the world. We cancelled her subscription and she didn’t have it for the next year. Maybe we reacted too over-the-top, but we didn’t have a clue what to do at the time. We all learned a lesson from that and it opened up our conversation to talk about the dangers online. I always try and have chats with my kids about what they are doing. I think the key is to allow them to talk to you and not just tell them off as they are more likely to respond well to that and not shut down and do things in secret. We encourage them to tell us if they have seen something upsetting or if anyone has been unkind to them. We have rules for both of them but it is very tricky to monitor their every move online. Try to guide them to make sure things like the school badge on a blazer or jumper is not in a picture, that their location is turned off. These are simple things but wouldn’t be something we would even have thought about. We would never, ever, take away our daughters' mobile phone, this is because it doesn’t solve the problem, it just puts up a barrier between you and your child. Don’t forget, this is their world, and this is their ‘normal’. It’s frustrating that up and down the country, schools have different policies on smartphone usage. Some allow them, other schools don’t. I will be very unpopular with my daughter for saying this, but I don’t think smartphones should be allowed in schools, primary or secondary. My son, Jacob, does not have a phone… yet, even though he has started asking when he can have one! And the age at which children start using a smartphone is around 10/11 years old but they are getting younger. He loves to watch videos on YouTube, and even has his own YouTube channel which I manage for him. He loves recording videos. A few of his friends even say they want to be YouTubers when they grow up. Which is seen as a career by youngsters who watch their favourite vloggers making lots of money and having fun. I will not stop him from wanting to record videos, because the creativity young people have online is fantastic and I can see the benefits of this. But, as with most social media, you have to be thirteen years old to have an account which is why I record, edit, upload and monitor the videos. We need to teach them online etiquette, they need to learn that if you wouldn’t say it to someone’s face, you don’t say it to them online. And they need to be aware of anything that is posted online could be there forever and companies are delving into the social media history on future employees. I sometimes feel I am muddling along as a parent and trying to do what’s right for my children. 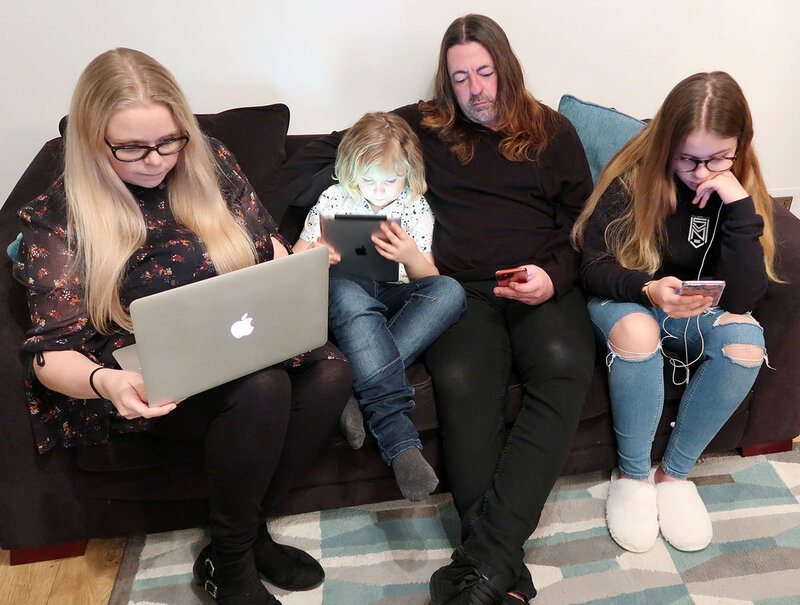 I think that between children, parents, carers, teachers and tech giants, we all have a role to play in making our online experience a good one, but that can only happen if we all work together. 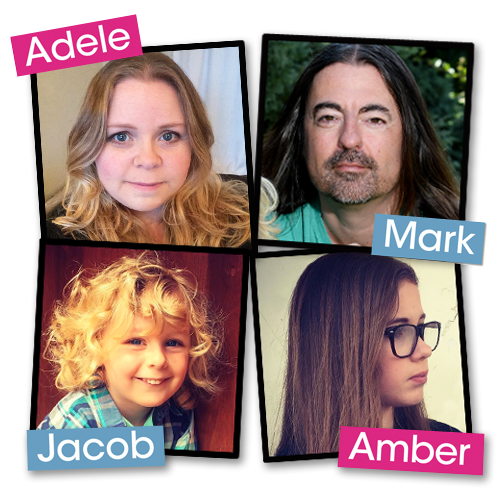 Parent-friendly social media platforms for kids: kudos.com, PlayKids Talk (appsdrop.com), popjam.com, kidzworld.com, gromsocial.com. Pre-installed parental controls are available for most smartphones, tablets, laptops and game consoles – but you can download additional software and apps. See internetmatters.org for a guide. Apps to keep your children healthy: Dungeon Runner: Fitness Quest, Habitz, Plant Nanny, Sworkit Kids and Zombies, Run! For advice on social media use: internetmatters.org, NSPCC.org.uk/onlinesafety, net-aware.org.uk. For advice on gaming: internetmatters.org. For age-appropriate information on puberty, take a look at amaze.org. And advice for families on staying safe, from ThinkUKnow, is at thinkuknow.co.uk. Make young children aware their bodies belong to them. The NSPCC has a fantastic PANTS activity pack (search “pants” on nspcc.org.uk ) with fun games and a funny Pantosaurus song to teach them “what’s in your pants belongs only to you”. Log on to selfharm.co.uk for more info and advice, or selfinjurysupport.org.uk , which has a text service for young women, and an any-age helpline. If you need more help visit your GP and ask for a referral to a therapist. Why not create a family contract? You can find a template for a family contract at childnet.com. If you are feeling really bold, why not unplug and create “screen free” zones at home? I was lucky enough to be invited to the launch of the Stop, Speak, Support campaign at YouTube Space in London. I have been working with Internet Matters for a couple of years now. Recording vlogs to help parents keep our children safe while online. 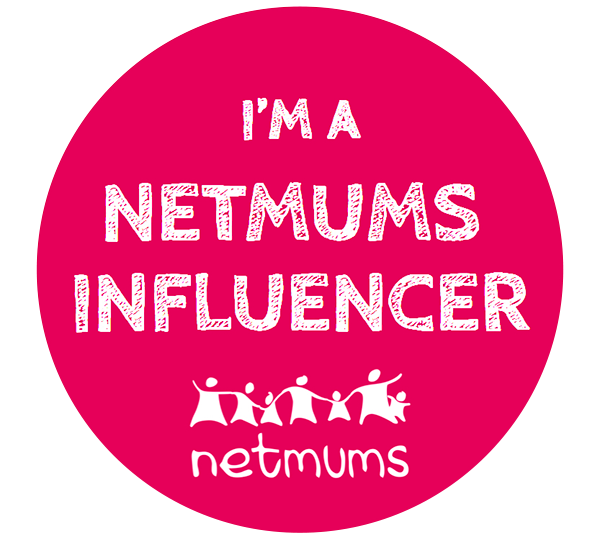 Internet Matters are a not-for-profit organisation that has a simple purpose - to help keep children safe in the online world. They offer lots of help and advice to parents. 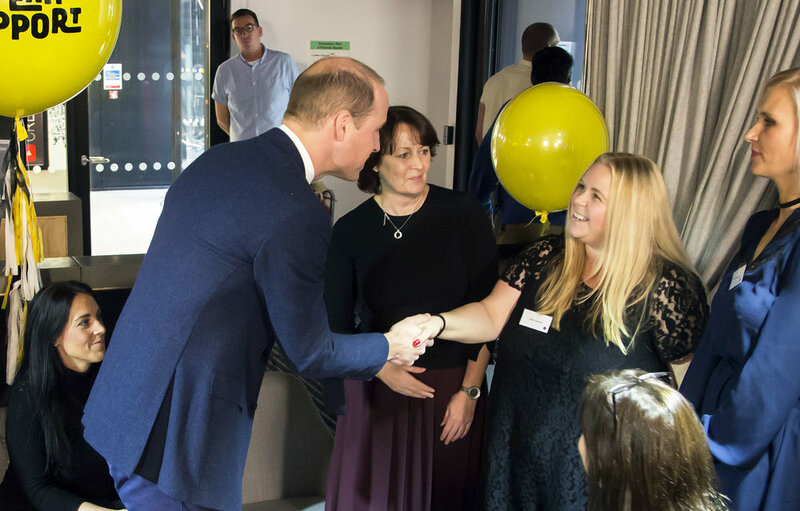 The Duke of Cambridge with the Royal Foundation has brought together some of the world's most recognisable names in media and tech, as well as children's charities and parents, to work alongside a panel of young people to find a way forward. Together they set themselves the task of creating a safer and more supportive life online. After more than 18 months of work, the Taskforce is unveiling an Action Plan to combat this problem. I was there as a parent, to listen to and talk about cyberbullying from a parents perspective. I feel like this is the biggest generational gap ever between us parents and our children. We don't have the experience of advice passed on from our parents as it didn't exist when I was a teenager. We try and keep our children safe everyday. We hold our children's hands when we cross the road, because we can see that danger. You can't see the dangers online. Cyberbullying is a horrible thing, it can make children's lives a misery and even lead to children taking their own life. When I was at school, if people were bullied, once they went home and closed the door, they were in the safety of their own home. The bullies couldn't get to them. With the rise of smartphones and other devices, children can be bullied 24 hours a day, seven days a week. The Duke of Cambridge believes that our largest social media, technology, gaming, communication service providers and media companies have a positive opportunity to create the solution to support our children online, and to help children feel empowered to question online behaviour, speak out and support their friends. I had the pleasure of meeting some very inspirational people. It was an absolute honour and a privilege to meet Prince William. He was really lovely and very engaging. I'm so pleased that The Royal Foundation have taken cyberbullying seriously and joined all these tech giants to help children and parents stamp it out. Internet Matters and other charities are playing a very important role. Carolyn Bunting, CEO of Internet Matters, said: “The Stop, Speak and Support campaign gives children a brilliant, positive focus and helps them to tackle cyberbullying in three simple steps. "Internet Matters is immensely proud to be supporting such a relevant and significant campaign, and being part of an industry task force which is working hard to combat cyberbullying. "We have published a guide on our website to help parents understand how their child can benefit from the code and give them practical advice on cyberbullying." Visit internetmatters.org for more information. ● Talk About It: If your child is using social media or communicating online, don't wait until they experience cyberbullying to talk to them about it. Ensure they are familiar with the Stop, Speak and Support code and understand the importance of making a positive contribution to their online community. ● Beware What They Share: Discuss with your child what they should be sharing online and how it could invite bullies. Talk to your child about what their friends share and how they can help support them if they've shared too much. ● Learn about it. Find out about the apps, social networks and online games they are using and what they are able to share through them. Find out if there is a social media element and who they are talking to online. ● Take Control: Check the apps they are using are age-appropriate, set safety filters on their devices and ensure privacy and settings are at the highest level on social media. ● Take It Seriously: Check in with your child regularly and look out for signs of cyberbullying. Remember that children can be targeted by cyberbullies at anytime and online bullies can be anonymous. Gently probe to see if they have witnessed anyone else being cyberbullied and remind them they can always talk to you. ● Block and Report: Teach your child what to do if they want to prevent or report abusive messages, including keeping the evidence with screengrabs. 1. The UK will today become the first country in the world to launch a national, youth-led, code of conduct for the internet - 'Stop, Speak, Support'. 2. For the first time ever two of the world’s biggest social media firms are adapting their platforms to provide direct access to support when bullying strikes. Facebook and Snapchat have worked with the NSPCC to create new functions that will be trialled among 1,000 young people. If successful, The Duke hopes it can become a global blueprint. 3. A major new commitment to design 'Safety Guidelines' has been agreed by the social media and gaming firms in the Taskforce, as well as creating a new compliance process, with the sole drive to commit all platforms to keeping children and young people safe. 4. Taskforce members are building a universal strategy for information, ensuring all online resources for support and help – whether aimed at young people or parents – are high quality, reliable and have common themes. Our campaign seeks to reach every single 11-16 year old in this country, aiming to empower all young people to take a stand against bullying. Bullying has no innocent bystanders, and all people online should feel able to look out for their friends, to stop the bullies, to speak out and to get support. The young people on our taskforce said they had rules and guides for every part of their life – but not online. This is the 'green cross code' for the web. It was a fantastic day and I hope that one day cyberbullying is stamped out for good. But we can only do that if we all learn together. 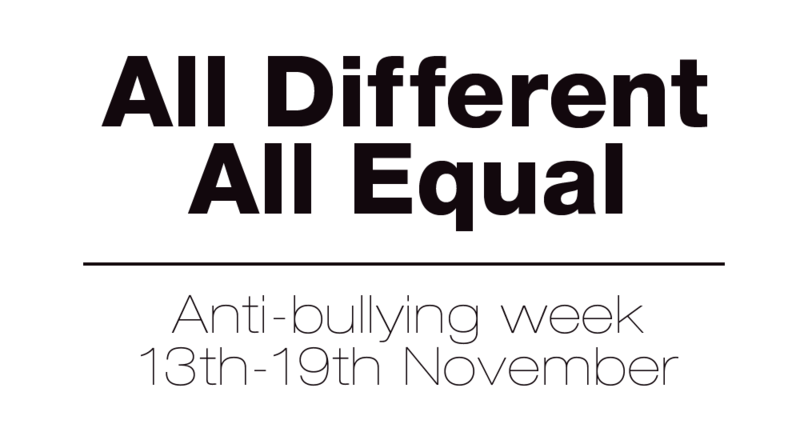 Today sees the first day of Anti-bullying week (13th-19th November). I have had the pleasure of working with Internet Matters on all aspects of keeping our children safe while they're online. They are passionate about keeping children safe while online. 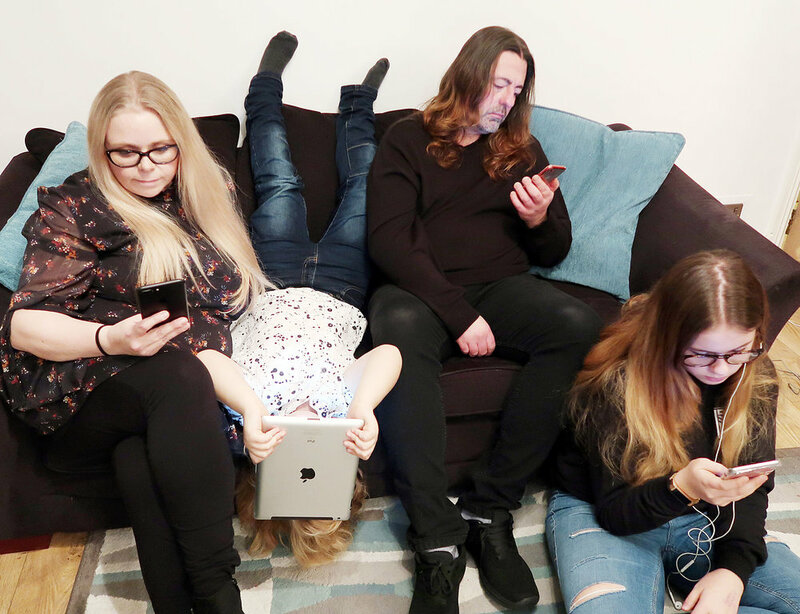 A not-for-profit organisation that has a vast amount of resources to help parents make their children's online lives fulfilling, fun and safe. And they have lots of advice on Anti-bullying week. This online world is still relatively new. And I think it's the biggest generational gap ever between parents and their children. In most other aspects of our lives, as parents we can say we've been there. Going through teenage years, finding new friends, falling out with friends and most of the pressures that come with puberty, we can say we've been there. But this is a whole new ball game. When I was at school, I was one of the few lucky ones, I wasn't bullied, nor did I bully anyone. I always tried to get on with everyone (and still do to this day), but obviously there were occasions when I fell out with friends. The bullies at school would make other children's lives hell, name calling, embarrassing them and even fighting in the playground. The difference from then until now, is that back in the day, that bullying stopped at the school gates. When you went home from school, you were in the safety of your own home. When you closed that front door, you knew no one from school could bully you. Fast forward to many years later and with the introduction of smart phones, kids can now be bullied 24 hours a day, 7 days a week. As a mum of a teenage daughter, this fills me with dread. She tells me 'It's not the same as when you were a kid'. And she's right. How can I as a parent help her when I've never been through it? This is where internet matters has helped me massively. I love the Internet and social media. I have learned lots of new skills and gained new friends just from the little screen I hold in my hands. My iPhone is never far away from the end of my fingertips. The way I use my phone it completely different to my daughter. She prefers Snapchat as a way to contact her friends. I use Facebook, Instagram and Twitter but I use them when I have been somewhere with my family, or have something special to announce. My daughter and her friends use it as a way of communication - every single day. Through Snapchat or Facetime, they are in contact all the time. And the speed at which she navigates through her phone is mind-boggling! Internet Matters have age appropriate advice for parents on ways of talking with your children about all aspects of their digital life, being responsible and talking to them about their online reputation. Obviously my parents didn't talk to me about these things, because they didn't exist! My husband and I are both learning along with our daughter about this new digital world - new to us, but normal to her. For more help and advice please visit Internet Matters. As a mum of two, a 13 year old daughter and a 6 year old son, I worry about the dangers of them being online. Neither of my children hardly watch TV anymore. My son loves to watch videos on YouTube, while my daughter prefers to spend time on Xbox Live, iPad, laptop or on iPhone. As a parent, we try to keep our kids safe in all areas of their lives, be it holding their hand while crossing the road, or making sure they have a seatbelt on. We have teamed up with Internet Matters to help parents keep our children safe while online. Cyberbullying is when someone bullies others using electronic means. This can happen via text, email, on social media networks and gaming platforms. It's important to set some parental controls so our children can enjoy their experience and stay safe at the same time. In this video with Internet Matters, I talk to you about setting parental controls and share my own experiences. Vlog series with Internet Matters: What is e-safety all about? We've teamed up with Internet Matters to talk to you about e-safety. So what is e-safety? E-safety is a term which means not only the internet but other ways in which young people communicate using electronic media, e.g. mobile phones. Gaming is the subject I know the least about. Gaming now is a million miles away from the world of Chucky Egg and Pacman that I used to play - there I go again sounding old! I have an iPhone and use it all the time. My daughter has one too so I want her to be safe when she's using it. With a few simple steps, you can set your child's phone to only see the things suitable for them. I've recorded a series of vlogs that you can find on Internet Matters YouTube channel, to offer some helpful tutorials, tips, and I share with you my own personal experiences of this amazing online world we now live in.